Russia is flexing its military muscle as tensions with the US simmer in the wake of a heated third US presidential debate, where Democratic candidate Hillary Clinton called Republican candidate Donald Trump a “puppet” for Russian President Vladimir Putin. Now, Russia has declassified the first image of its new thermonuclear intercontinental ballistic missile. To make it even more frightening, the Satan 2 is also capable of evading radar defences and could travel far enough to strike the US East and West Coast. In accordance with the Decree of the Government of the Russian Federation: On the state defence order for 2010 and the planning period 2012–2013. 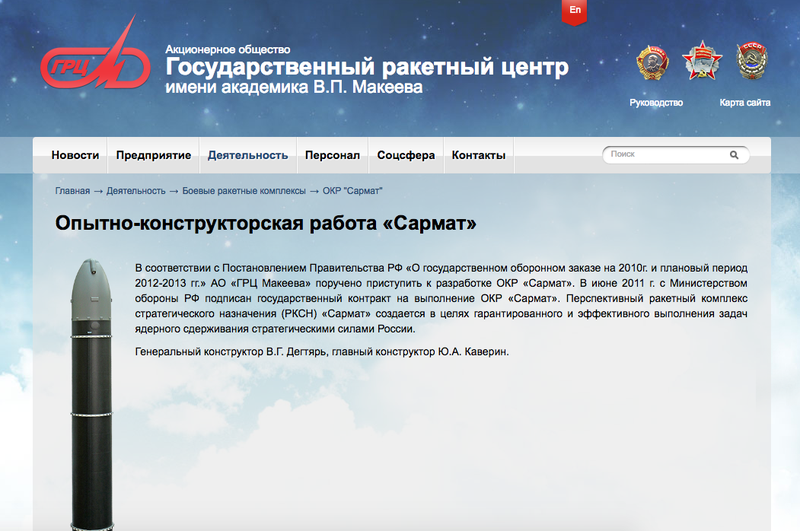 JSC SRC Makeyev instructed to begin the development of OCD Sarmat. In June 2011, the Ministry of Defence of the Russian Federation signed a state contract for OCD Sarmat. Prospective strategic missile systems (RKSN) Sarmat is created in order to secure and effective nuclear deterrent tasks of Russia’s strategic forces. This rough translation can give you at least some insight into how long the engineers have been working on this missile, and it shouldn’t be a surprise to anyone who has been following the US-Russia relations. In 2013, Russian announced it would begin deploying a new type of long-range missile to replace its Cold War standby, the original Satan missile. The Satan 2 missile is the realisation of the deployment.